Any individual, company or organization can establish a group. What kind of groups can I form? Many of these committees have websites that become active and eventually die out because the person who manages the website leaves. Not anymore. Anyone can maintain the group and no advanced skills are required. A good example of that are the Technical Committees of the ISSMGE. Promote a student organization at a University. A good example of that is the Student Organization of the Universidade Federal do Rio Grande do Sul. Maintain contact and Network with Geotechnical Alumni of a University or College. A good example of that is the Alumni Geotechnical Group of the University of Michigan. Form a formal or an informal scientific group that shares the same professional interests. A good example of that is the Cone Penetration Testing Group. Create a research page to promote your research work. Geotechnical Engineers interested in your research, will be able to register and receive automatic updates from this research project. You can even make your research public and available to non-Geoworld members. Through Groups, all research projects can afford to have a research website with no effort! An example of that is the US National Science Foundation research project on the "Seismic Response of Municipal Solid Waste Landfills". Any other collaboration or outreach activity (such as an events page) can also be supported by our Groups. How do I create the group? You will see a form. Fill in the group's information. A group can be “open” (anyone can join) or "closed" (permission is needed to join a group). There can be one or more administrators in a group. The content of the group can be moderated. Some content can be available to the public (even without being part of the group), some content can be available only to members. Administrators can control that. 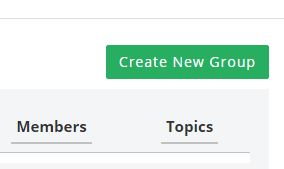 When material is added on the Group page, it will not only be promoted there. Any activity in the Group will be automatically shown on the “Home” page (first tab on the gray navigation bar) of the members who have registered to the Group. Thus, the information reaches its members, regardless of whether visited the group page or not.